Tag Archive | "Driver’s Seat"
When we first entered the Jeepin’ community as a magazine in the fall of 2017, we were invited by Central Florida’s Blackwater Jeepers to sponsor the first annual Jeeps vs. Harleys event. It was a baptism by fire, and I mean that in the best possible sense. My family, the magazine staff and I quickly learned that the off-road lifestyle is about much more than wheelin’. It’s about enjoying the time we have together while pushing the limits of our abilities and giving back however and whenever possible. It’s a way of life. Every Jeepin’ event is special, but Jeeps vs. Harleys was our first, so it will always hold a unique place in our hearts and minds. You can only imagine how delighted we were when Coty Byers, Blackwater’s president, asked us to produce the event starting in 2019. It’s an ideal setup. We have learned so much about the Jeepin’ community over the past two years, and my company has been producing automotive industry events from Orlando to Las Vegas for more than 20 years. You might wonder what we plan to change, and the answer is not much. 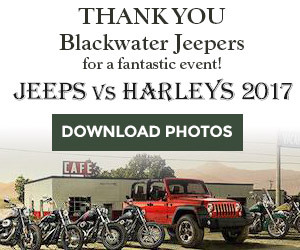 Jeeps vs. Harleys organizers have already built an enviable following of off-roaders, riders, spectators and vendors. 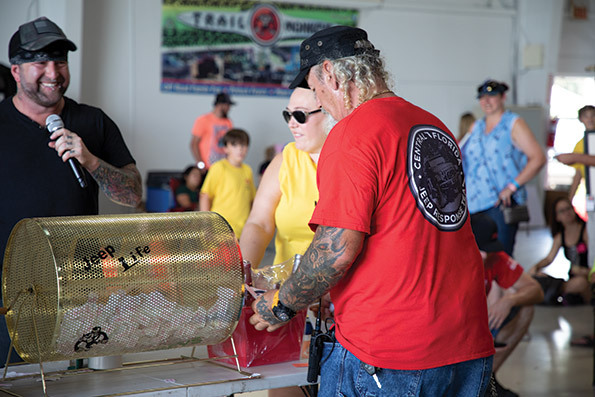 Attendees have a good chance to win a trail- and highway-ready Jeep or Harley, among other raffle prizes, including kids’ toys and gear. The food, the live music, the spirit of charitable giving — none of that will go away on our watch. Our plan for 2019 and beyond is to get bigger and better. Instead of one starting point for the convoy, we’ll have three. We will also send two lucky winners on an all-expense-paid trip for two to Moab, Utah (for the winning Jeeper) or the Sturgis Motorcycle Rally in South Dakota (for the winning Harley rider). 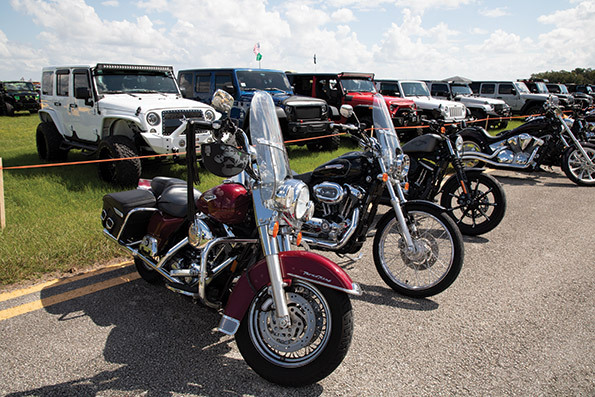 We will invite area Jeep and Harley dealers out to showcase their lineups. We will have more vehicles, more spectators, more vendors, more music, more food and more fun. So stay tuned to the magazine and our website for updates, and if you are so inclined, spread the word. Everyone is welcome at Jeeps vs. Harleys, an event that celebrates rugged individualism just as passionately as community togetherness. That’s the spirit upon which this magazine was founded, and we couldn’t be happier or more honored to have this opportunity to take a more active role in this amazing event. As a police officer’s kid, I had a very personal relationship with law enforcement. My father went from the Marines to the police departments of several major cities before he decided we would all be better off in a small town. We moved to Belleair, Fla., and my dad joined a local police force. He rose to the rank of lieutenant and served with pride and distinction as he helped keep our tightknit community safe. Unfortunately, no police officer serves without risking his or her life. We were all reminded of this when Officer Jeffery Warren Tackett, a 28-year-old member of the Belleair Police Department, was shot and killed in the line of duty on June 13, 1993. We knew Officer Tackett. Several months after the funeral, I asked another officer how Tackett’s young widow and his family were doing. He was embarrassed. This officer — one of the nicest and most caring members of the department — wanted to visit. But he always hesitated. He didn’t want to be reminded of what could happen to him, nor did his own family. He resolved to check in on her soon. I was surprised at his response, but I understood. And I was reminded of that conversation recently, when I learned about an organization called COPS, for Concerns of Police Survivors, after sponsoring November’s third annual Krawl’n for the Fallen. I connected with the president of the West Central Florida chapter, Cindy Roberts, to inquire about making a donation. Cindy is herself a survivor, having lost her husband, Corporal Michael Roberts, in the line of duty on August 19, 2009. She filled me in on what a wonderful organization COPS is and the continuing outreach, support and counseling they offer to grieving families. You may already know that the magazine is sponsoring the purchase and buildout of an off-road-ready 2005 Jeep Wrangler, which will be raffled off at Jeep vs. Harley in October. Well, we decided to double down. In January, we purchased a 2003 Harley-Davidson Fat Boy with less than 15,000 miles on the odometer. It’s a beautiful bike, and it will join our Wrangler as a raffle prize, with the proceeds to benefit our local chapter of COPS. Joining the Central Florida Jeepin’ community means tapping into a reservoir of charitable giving many of us didn’t even know we had. The time, money and resources donated by Jeep groups is incalculable. We are happy to do our part, and we can’t wait to see you in October. New trails are the best kind. You never know what obstacles you will encounter. It’s a test of your off-road skills and vehicular capacity. Every success is uniquely triumphant. Every failure is a true learning experience. It’s better than real life. After 20-plus years in the automotive publishing game, I can tell you there is no greater thrill than assembling the first issue of a new magazine. Jeepin’ Central Florida may have topped them all. There was a lot at stake. Our vision for this magazine was ambitious. We want to be more than an editorial or advertising vehicle. We want to be a resource in the truest sense of the word. My brother, Eric, and I are dedicated Jeepers, and it’s a passion we share as a family – with our wives, our kids and our dearest friends. It’s easy to make friends on the trail, where everyone is equal. We have seen the mantra of “No Jeep left behind” played out countless times. We have seen how Jeepers from all walks of life band together to come to the aid of charities, law enforcement agencies and each other. Every event we have attended has been tied to a worthy cause. We have launched many publications and trade shows over the years. They have always been based on detailed business plans with ongoing revenue projections. JCF was very different. Our primary goal is to support the Jeeper community and your causes. We want these pages to be filled with feel-good stories as well as useful, practical advice for building your Jeep and taking it off-road. Thanks to the contributions of experts in the fields of automotive sales, repair and customization, off-road navigation and safety, law enforcement and more, we were able to pull together an inaugural issue to be proud of. To keep JCF going, we need your help. We need your stories. We need to know about the events you’re organizing and the charities you support. We need your technical expertise, your trail leadership and your advice. We need your war stories. And if you know any advertisers, we need them as well. So please enjoy this first issue of Jeepin’ Central Florida, and as you peruse these pages, think about what you like and dislike and what you would like to see in the next edition. Then let me know. This is your magazine, after all, and Jeepers are like family. Thank you for reading. © 2019 Jeepin' Magazine by MG Business Media.